Several years ago, when my aunt Rosa came to visit us from Canada, she brought us some maple syrup. That's when I first found out that the typical syrup we used when having pancakes were actually only "maple-flavored syrup." A few years ago, I bought some maple syrup while I was at Trader Joe's, but I've never had any chance to use it. After I got myself an ice cream maker, I thought maybe I could try using maple syrup instead of sugar... 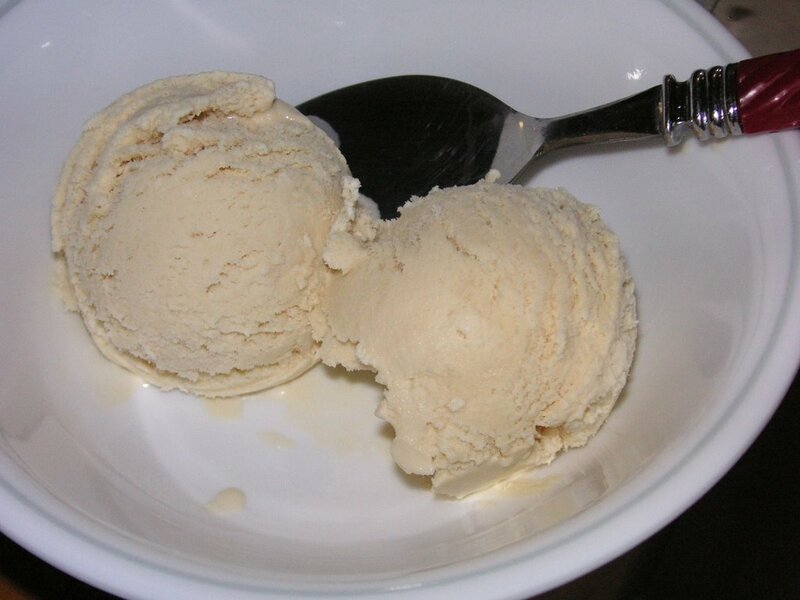 So here it is--homemade maple ice cream. The flavor? Well, the maple definitely comes through, having used 3/4 cup of maple syrup. However, it also tastes rather familiar. It seems very similar to the butter pecan ice cream I used to get from Thrifty stores (which are now Rite-Aid stores). Without the pecans, obviously. I guess this explains why so many of the recipes online are for maple pecan ice cream.